Day one commences with an introductory lecture from Dr M explaining how to distinguish between pleurocarpous and acrocarpous mosses (see below) and other important bryological skills. 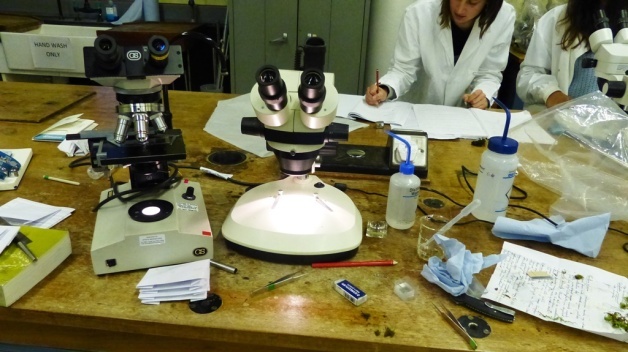 This is followed by a lab session and close examination of six common mosses in which students practiced and perfected the skill of preparing microscope slides of leaves of each species. 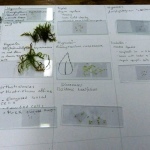 Here are two images of mosses made by one of Dr M’s students and you can get good results by simply putting the lens of your digital camera against the objective of the microscope. First time is not always lucky and you usually need to experiment a few times with different angles and microscope and camera focus, but it is possible to build a nice collection of reference leaf slides in this way. 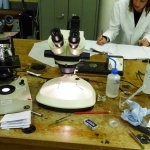 Close examination of moss leaves under the microscope (x40 or x100) is an important step in the identification of mosses to genus and species, especially some of the more difficult genera. After lunch Dr M and students are joined by a trio of bryophyte experts and the students into four groups and they all go out on a bryophyte hunt on the lovely award-winning green campus at Reading to find and collect samples of some of the common mosses and liverworts. 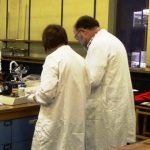 These samples are then stored in special moss packets made from folded sheets of A4 paper and samples are tidied up back in the lab ready for closer examination during the second day the following week. Day two starts with a lecture by Dr M on the orders of bryophytes, designed to help students to get a feel for how to pigeon-hole the range of variation amongst mosses into orders (see below). Before the coffee break there is a short practice session keying out a moss using the key in the British Bryological Society field guide. After coffee was the return of the experts to help students check and verify the mosses and liverworts collected the previous week. After lunch time permitting there is a further field walk to the horticultural area (good for common “flowerpot” mosses and liverworts) and the Chemistry car park with its wonderful bryophyte-drenched cobbles and bollards to collect some additional acrocarp mosses and liverworts for identification. 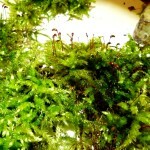 Mosses can be grouped (artificially) into two main types based on growth form – acrocarps and pleurocarps. Acrocarps are unbranched (or sparingly dichotomously branched) and of erect or ascending habit (upright). The leaves are rarely glossy and not chaff-like and the plants often form cushions or turfs (like carpet pile). The leaves usually have a nerve (sometimes called a midrib or costa) and this may be excurrent. When present, capsules are terminally positioned. 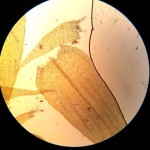 Microscopic examination of a leaf will show that the leaf cells are isodiametric (more or less as wide as long). Pleurocarps are regularly, often pinnately branched, and of prostrate habit. The leaves are often glossy and chaff-like and the plants form dense mats or looser wefts. The leaves may be with or without a nerve although an excurrent nerve is rare in pleurocarps. Capsules when present are axillary. 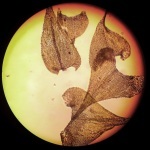 Microscopic examination of a leaf will show theat the leaf cells are longer than wide. For getting to know mosses, Dr M recommends the recent and splendid publication from the British Bryological Society (BBS): “Mosses and Liverworts of Britain and Ireland: A Field Guide“, and this includes a useful field key to identification of mosses and liverworts. The BBS field guide separates mosses into orders (the taxonomic rank above families and below class). Dr M finds this separation into orders a rather useful way to introduce beginners to mosses, because there are certain features which define each order. Once you have mastered these, you can more easily place any new moss into its correct order and then check the relevant section in the BBS guide and in this way get much further towards a correct identification. 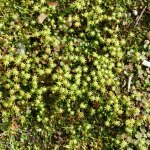 Dr M’s marvellous mosses is an introduction to these great little plants, and includes the nine most common orders of mosses,click on the links below for more information and images. In the list above, the Polytrichales to Orthotrichales are all acrocarpous mosses, while the Hypnales is a very large order containing most of the pleurocarps – if you find a pleurocarpous moss it is in the Hypnales almost for sure! There are at least eleven other moss orders occurring in Britain and you can find out more about these again in the BBS field guide – a great place to start your bryological journeying. 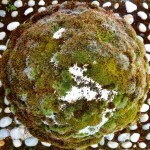 For the Sphagnales see Charlie Campbell’s post here, and Dr M plans to deal with the wonderful Sphagnaceae – the inimitable bog mosses – later on! 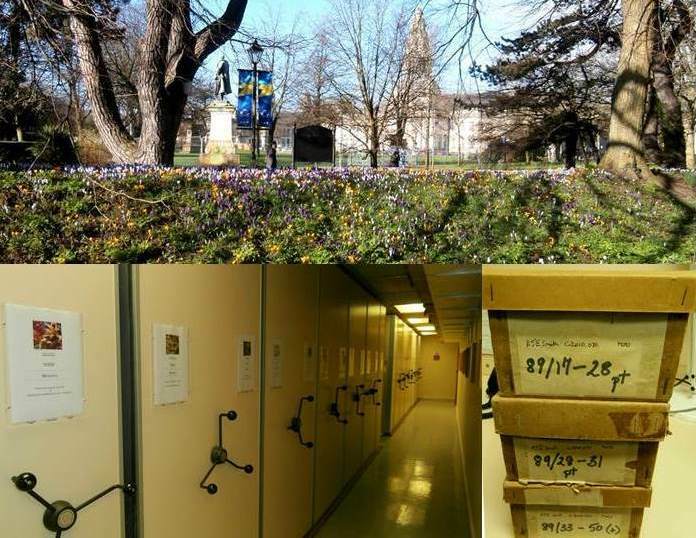 This image shows the National Museum of Wales, Cardiff, the home of the British Bryological Society Bryophyte Herbarium. The Museum also houses the collection of the late A.J.E. Smith, the British bryologist who wrote the definitive Moss Flora of Britain and Ireland (2nd edition 2004) and who also, incidentally, taught Dr M bryology at Bangor University, North Wales (or UCNW Bangor as it was known then) in the 1970s! Dr M has fond memories of the UCNW Malham Tarn field course in 1976. The torrential rain every day did nothing to deter Tony Smith (“little Smith” as the botany students affectionately named him) as he lead us deeper and deeper into the calcareous mires, explaining the intricacies of bryophyte diversity and identification to us rain trickled, deeply soggy and, it has to be admitted, less than bryologically enthused students! 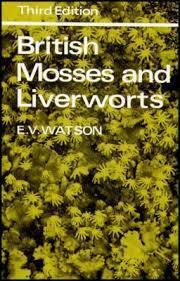 Another indispensable book for bryophyte ID is the late Eric Watson’s classic “British Mosses and Liverworts“. This is high on Dr M’s hot list of favourite ID books of all time, combining as it does expert descriptions of most of the species likely to be encountered by the beginning to intermediate student with brilliant line drawings of the key ID features. The taxonomy is now rather out of date (e.g. 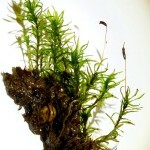 many genera in Pottiales have been reorganized on the basis of recent molecular research) but its a small price to pay. Dr M recommends purchasing this (the 3rd edition is most up-to-date but you can sometimes find second-hand copies of the still useful 2nd edition quite cheaply) and using it alongside the more recent BBS field guide. So my rule of “acrocarps are small and pleurocarps are big” isn’t infallible?